Eyes Improved: Constant Battle – We Got This! I am going to put out two posts today. One good, to follow. One not so much. I’ll start with the positive, since I am still gathering information on the other. The insurance company is off-the-hook. They are not to be blamed even one iota. I am so sorry for jumping to the wrong conclusion. The therapy company, Capital Home Health, well… that’s another story. Betrayal and cover-up are the topics of the day. 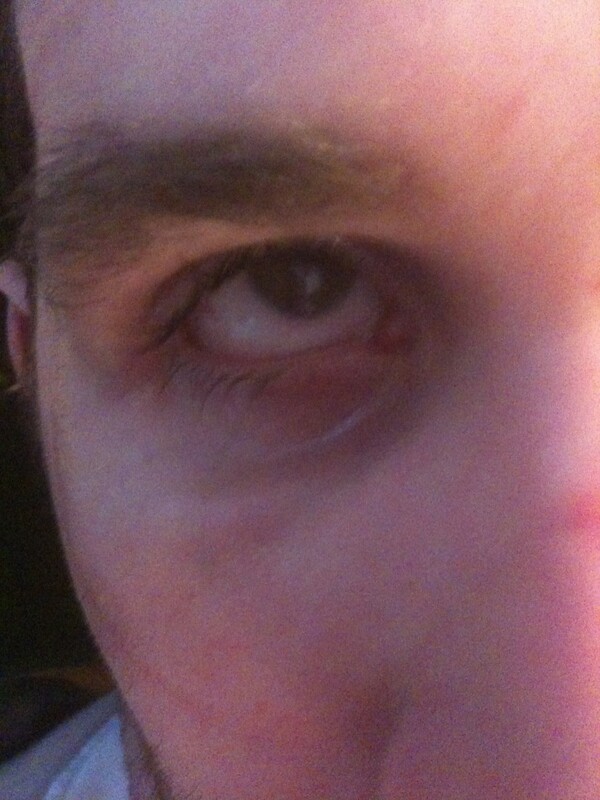 Right Eye Abrasion Healed. Eyes will be a “Constant Battle”. Dr. Hinkle stopped by yesterday morning to see how Ryan’s eyes where progressing. Remember last week Dr. Hinkle located a noticeable abrasion (i.e., erosion) below the right pupil. This needed careful monitoring and around-the-clock treatment. We were putting one or another type of lubricant in it every two hours or less. Ryan's right eye improves since last week. The treatment worked! Dr. Hinkle was right on target for getting this resolved. While we will continue to lubricate his eyes on all the even hours, the mix of lubricants is less complicated. Dr. Hinkle really is “The Man”. The reality is this will likely be an ongoing concern. Eye health is so delicate. As I arranged it in my own mind, it has three component: 1) Tear Production, 2) Nutrition, and 3) Exposure. Specific to Ryan, he seems to have adequate tears. We also know his nutrition is excellent. This, deductively, leaves exposure as the culprit. Exposure, in my growing ocular knowledge, seems like it’s the hardest to treat given Ryan’s condition. He rarely closes his eyes. When closed, it’s not long enough to promote significant healing. Finally, his blinks are incomplete. Hence, he wears the goggles but they only do so much. Because Ryan has deep-set eyes, it is impossible to securely tape them closed. Believe me, we’ve tried. It was too risky as he might open them under the tape/bandage/patch and really do some damage. So, the treatment for now is to keep a protective lubricant film between his eyes and the environment. I might not be ahead of this yet, but I’m getting better. Thank you Dr. Hinkle, you’re a wonderful man! Boy Ken, here all this time I thought you were “The Man”, never imagined you could be de-throned! This is wonderful news about Ryan’s eyes. This is just another testament to the fine group of medical professionals you have gathered, not to mention the home care you provide to Ryan. Please don’t keep us waiting too long for your other post — inquiring minds want to know!! Dr. Hinkle, I’m trying to find all the words I want to say to you–for now, I’ll say that I admire, respect and am filled with gratitude for the person you are. Ken, it is because you have meticulously followed Dr. Hinkle’s treatment protocol for Ryan’s eyes that they are doing so well. What I’m curious about is – have you always had this ability to learn about something so quickly and then do it? I mean, a lot of this medical stuff is complicated!! Then there’s all the insurance and legal paperwork, plus, the medical research you do on nutrition, therapy and healing…and the laundry, etc. –and you still have a sense of humor. Methinks thou art a renaissance man! What, oh what, did Capital Home Health do? I can feel my tiger blood starting to boil. Betrayal and cover up? As they would say across the pond, this is not to be born! I hope they didn’t willfully do anything that might hinder Ryan’s continued recovery process. I wonder if a formal complaint will need to be filed. Going away now to pray and settle my nerves in preparation for what you’re going to reveal to us next. That is great news about Ryan’s eye. I hope it continues to improve. I’m kind of dreading the not so good news, but like everything else that has come your way, you will process it and then deal with it.